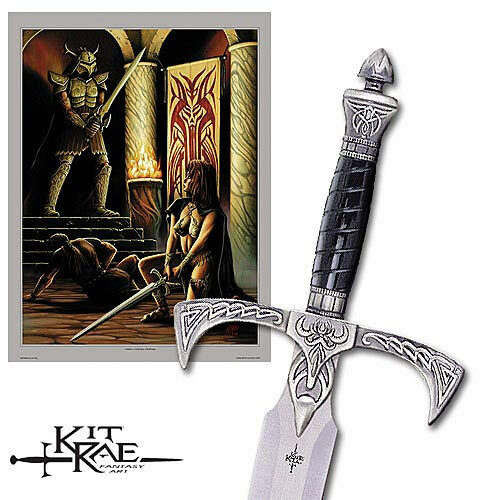 "Kit Raes ""Elexorien"" Sword" | BUDK.com - Knives & Swords At The Lowest Prices! Famed fantasy artist Kit Rae's epic mythological tale "The Tale of the Swords of the Ancients and Other Blades of Power" brings you this incredible high quality sword! Ten powerful swords were crafted with individual special powers that together would maintain order and harmony in the fantasy world of Ammon. This unique offering is Elexorien, the Sword of War, which was used by Queen Vaelen against the forces of the Dark One. Elexorien granted strategic power and command in order to unify great numbers of people for a single cause. Measuring 36" overall, the sword features a cast metal handle with intricate carved details, antique silver finish, and a simulated black ivory fluted grip. The 27" tempered stainless steel blade is etched with ancient runes that speak of the sword's great powers. This item includes a Certificate of Authenticity and an 18" x 24 1/2" full color art print. Wield this epic sword yourself! United Cutlery, UC1121.